The Digicel family extends their best wishes to Papua New Guinea’s six-member Paralympic Team as they depart Port Moresby on Thursday 1 September for the Rio 2016 Paralympic Games. 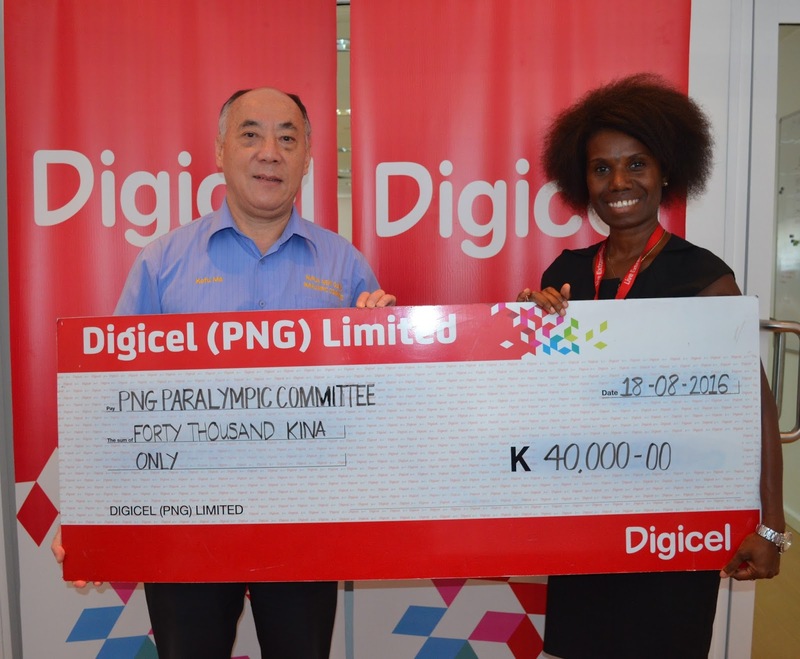 Digicel is a passionate supporter of sports in PNG and has provided a K40,000 cash sponsorship to assist the PNG Paralympics team, their coaches and support staff as they travel more than 16,000 kilometres from Port Moresby to Rio de Janeiro in Brazil. Digicel’s Managing Director Mobile, Shivan Bhargava said PNG is behind the team. “It is an honour and privilege to represent your country in sports and Digicel is delighted to be able to contribute in this small way to help our athletes achieve their goals,” he said. Mr Bhargava said the cost of fitting out and transporting an entire Paralympic team would be significant. “We hope Digicel’s sponsorship helps take the worry away from the athletes and allows them to concentrate on their sport and enjoy the experience even more,” he said. On receiving the cheque, Chef de Mission Dr. Kefu Ma thanked Digicel for backing the Paralympics team once again. “Digicel has been a huge supporter of PNG Paralympics since the Beijing 2008 Paralympic Games, and we are grateful for Digicel’s timely support for our athletes at this time,” he said. PNG’s 2016 Paralympic Team includes a blind athlete Joyleen Jeffrey, who will be competing in the 100m and 200m T12, and Samuel Nason competing in the 400m T47. Two coaches Peter Aglua and Samu Sasama are staff of PNG Sports Foundation and National Sports Institute and will be accompanying the athletes to Rio. The 2016 Paralympic Games will be held in Rio from 7–18 September and will feature 4400 athletes from more than 170 countries. Papua New Guinea has competed in several Paralympic Games since 1984, including Beijing in 2008 and London in 2012. The country’s first ever Paralympic medal was won by Francis Kompaon, who won silver in the men’s 100m sprint final in Beijing, finishing just 0.05 seconds behind the gold medal winner from Australia. The Games are expected to leave a long lasting legacy for the people of Rio de Janeiro in a variety of areas including education, culture and sustainability.